Product #21230 | SKU 340961 | 0.0 (no ratings yet) Thanks for your rating! The 35mm f/1.4 DG HSM Art Lens for Pentax DSLR Cameras from Sigma is the first entry into Sigma's Art series of professional lenses, with an emphasis on artistic expression and the creative potential of the lens. With a bright f/1.4 maximum aperture, floating inner focusing system, and Hyper Sonic Motor (HSM) you'll have quick and accurate control over the artistic effects achieved by the lens' high quality elements. For wide angle photography, this 35mm lens and its circular 9-bladed f/1.4 aperture ensure excellent brightness and blurred background (bokeh) effects. The Super Multi-Layer Coating reduces flare and ghosting and provides sharp and high contrast images even in backlit conditions. The lens' Hyper Sonic Motor (HSM) and floating inner focusing system ensure that you experience quick, quiet and precise autofocusing whenever you need it. Adjust focus using either autofocus (AF), or full-time manual focus, without having to switch camera modes or change settings - just flick the switch from AF to MF. For greater build quality and strength, all metallic parts and the new Thermally Stable Composite compound material (TSC), are housed internally. Its brass made bayonet mount has both high accuracy and durability, and a special treatment is applied to its surface giving it greater strength and making it highly resistant to long-term daily use. With a bright maximum aperture of f/1.4 this lens allows you to capture images with beautiful defocused background bokeh effects in darker conditions - using faster shutter speeds and lower ISO sensitivities. This lens' motor is driven by ultrasonic waves to provide quiet, high speed autofocus. This Hyper Sonic Motor (HSM) ensures high speed and quiet AF as well as full-time manual focus override by rotating the focus ring. For stable focusing, this lens moves its inner lens groups without changing the lens length. It also compensates for astigmatic aberration and provides extremely high optical performance for close-up photos. This lens has a minimum focusing distance of 30 cm so you can capture wide-angle close-ups from nearly a foot away. This lens' coatings reduce lens flare, internal reflections and light scattering that can occur between the surfaces of its glass elements. This lens incorporates "F" Low Dispersion (FLD) glass elements, which have performance equal to that of fluorite, and Special Low Dispersion (SLD) glass elements. By optimising the power alignment of the lens, chromatic aberration has been corrected, achieving high image quality through the entire focusing range. This is a large-aperture lens with wide angles and a short minimum focusing distance. Because of its great peripheral illumination, or lack of vignetting, it is an ideal lens for DSLR Cameras and traditional 35mm SLRs alike. Sigma has organised all of its interchangeable lenses into three product lines: Contemporary, Art and Sports. The Art line delivers high-level artistic quality with a focus on sophisticated optical performance and abundant expressive power. 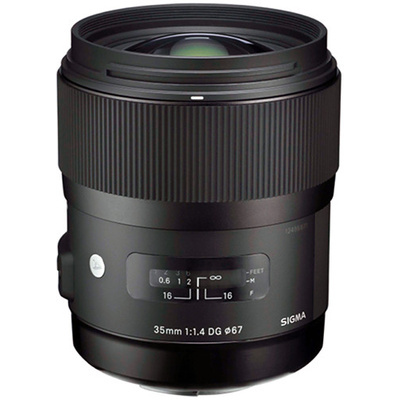 The SIGMA 35mm f/1.4 DG HSM is the first lens from the Art line. Developed with an emphasis on artistic touch, Sigma's Art line lenses are designed to meet the expectations of users who value a creative, dramatic outcome above compactness and multifunction. The 67mm front filter thread is fixed, allowing rotating polarising filters to be used with the lens. With nine circular blades, the lens' diaphragm delivers very pleasant, soft bokeh background effects. This lens incorporates a brass made bayonet mount which has both high accuracy and durability. A special treatment to reinforce it is applied to the surface, giving it greater strength and making it highly durable for long-term use. For better usability, the designs of the lens cap and AF/MF switch have been improved, as well as the rubberised lens hood attachment. In order to ensure accuracy and precision, all metallic parts and the new Thermally Stable Composite material are housed internally. Sigma used to measure lens performance with the standard MTF (modulation transfer function) measuring system, using conventional sensors. However, they have since developed a proprietary MTF measuring system - dubbed "A1" - using 46MP resolution Foveon direct image sensors. Previously undetectable high-frequency details are now within the scope of their quality control inspections.